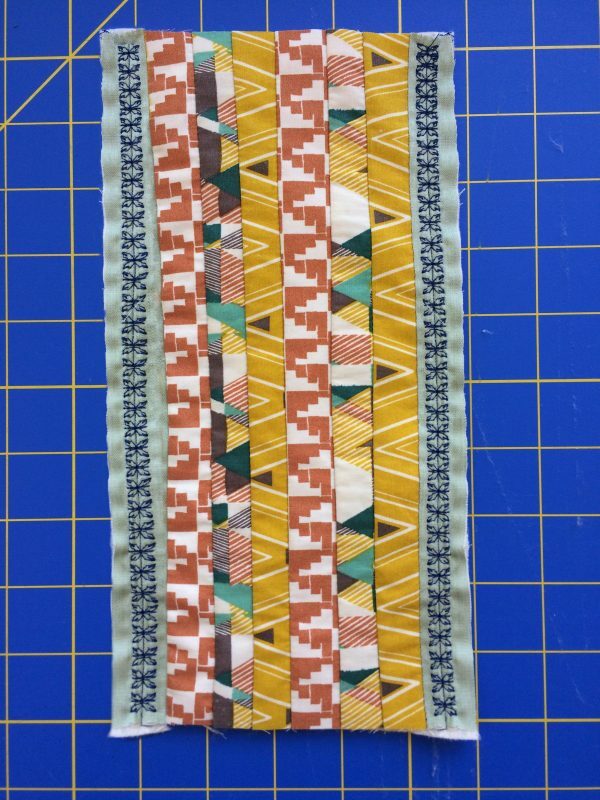 While organizing my sewing room a couple of weeks ago, I came across some Artisan Fabrics that I had laying around, and of course I had to come up with a new project for it. 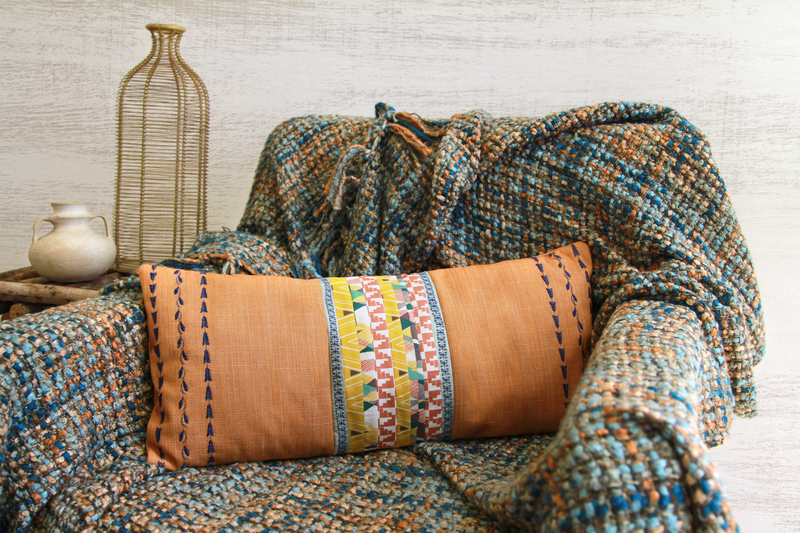 So I decided to create this bohemian Gypsy Queen Pillow Case, which also has a bit of The Denim Studio by AGF. Have fun creating this artsy piece of home décor with some amazing decorative stitches! Prep your sewing machine with Open embroidery foot #20/#20C/#20D and thread it with Aurifil cotton thread #2783. 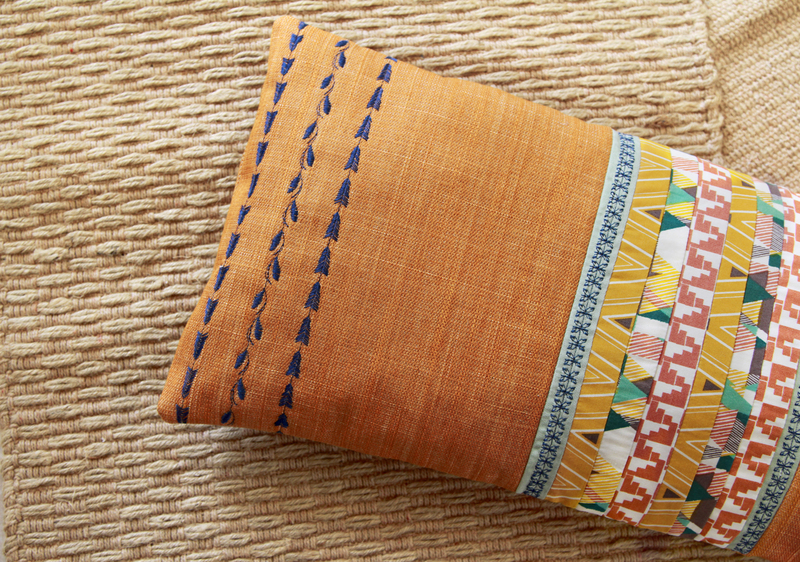 Get the first 9″ by 10″ of FABRIC F and 1 (one) 9″ by 10″ of batting. 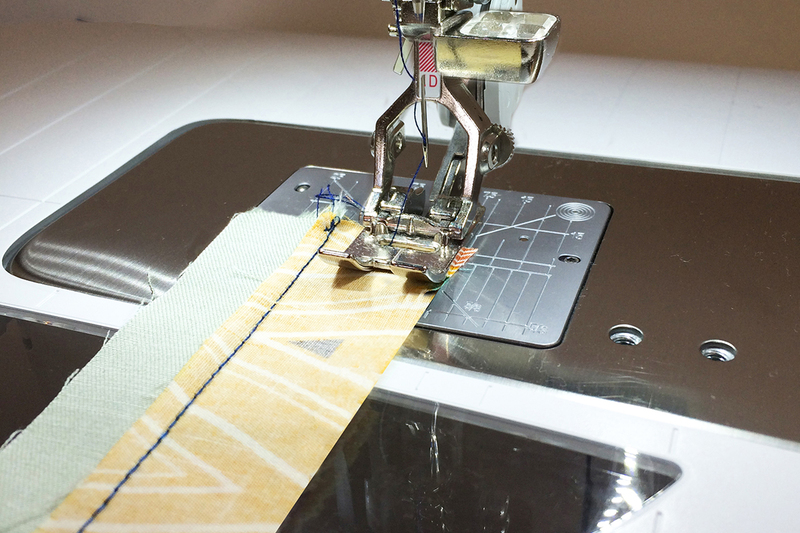 Change stitch number on your machine to decorative stitch #468, or a decorative stitch of your choice. 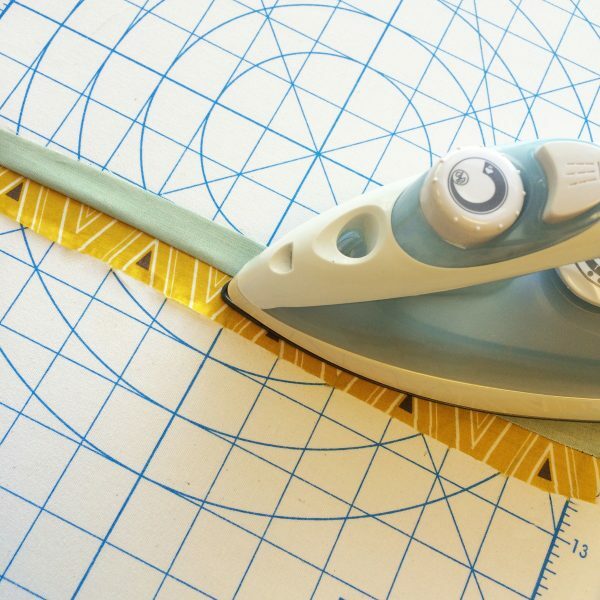 Prior to stitching, using your erasable pen to trace three lines 1” apart (from edge of the fabric to the right) for a guide to follow while sewing. 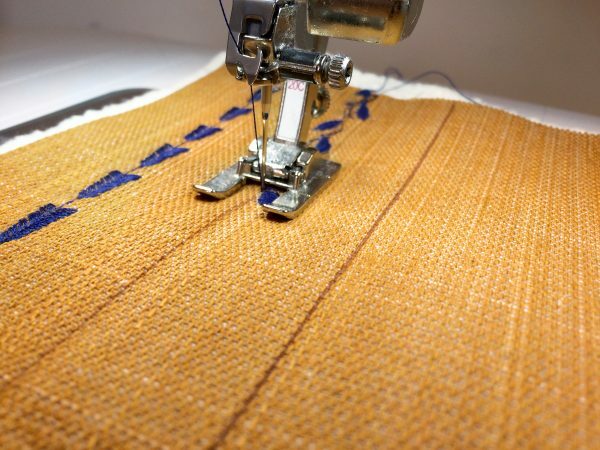 Once the first row is complete, change the stitch number to #117, or choose a different decorative stitch. Follow the next drawn line as a guide while sewing. Now go back to stitch #468 (or the first decorative stitch used), but this time you will turn your piece to sew in the other direction. Now, you will have a piece looking like this. 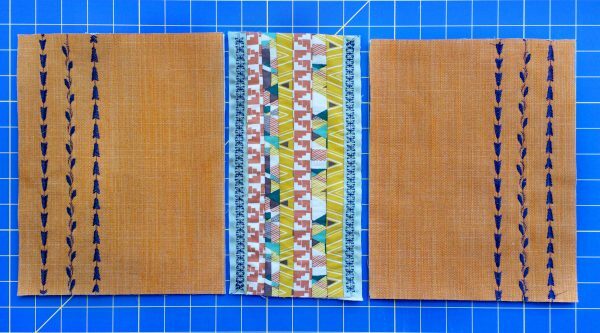 Trim extra batting and repeat the same step with the last 9″ by 10″ piece of FABRIC F.
Take all the 1″ by 10″ pieces of FABRIC A, B, C, D and E and place them as shown below. Replace the presser foot to the all-purpose Reverse pattern foot #1/#1C/#1D and use straight stitch #1. 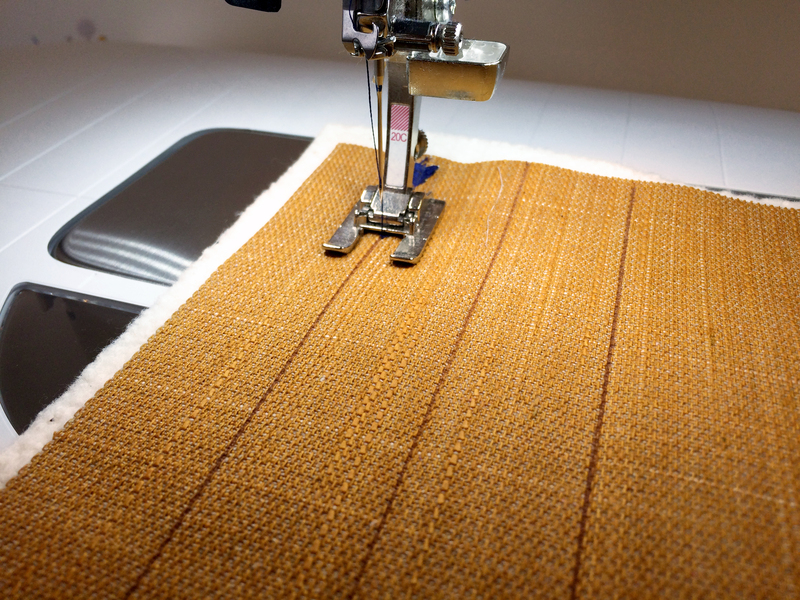 Using a 1/4” seam allowance, stitch the first two strips together from top to bottom. Continue by adding the next strip to sew with a 1/4″ seam, right sides together. 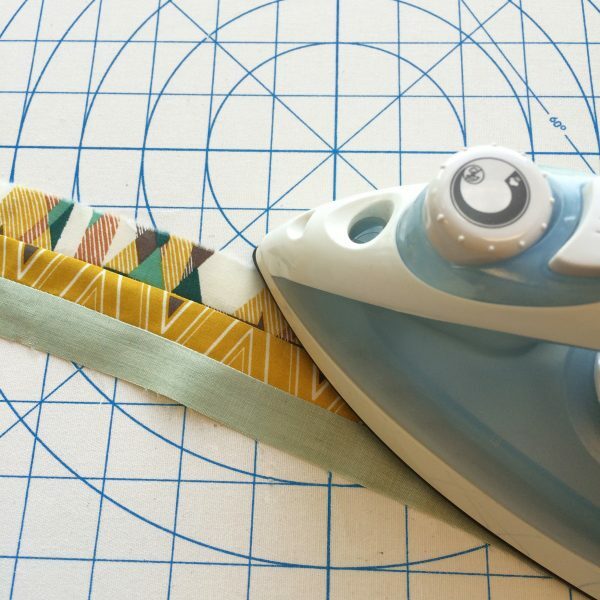 NOTE: In order to have straight edges when sewing strips, flip the direction in which you are stitching. 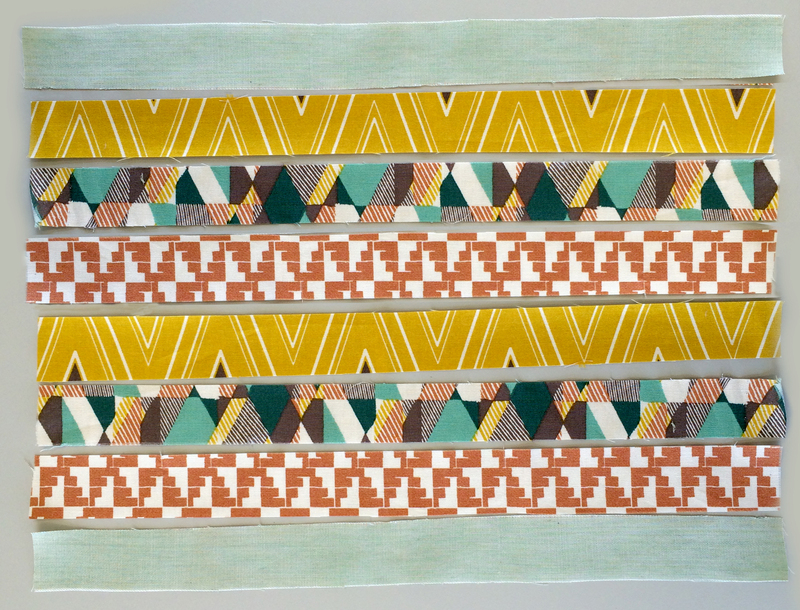 That way, the final piece will not have curvy edges. 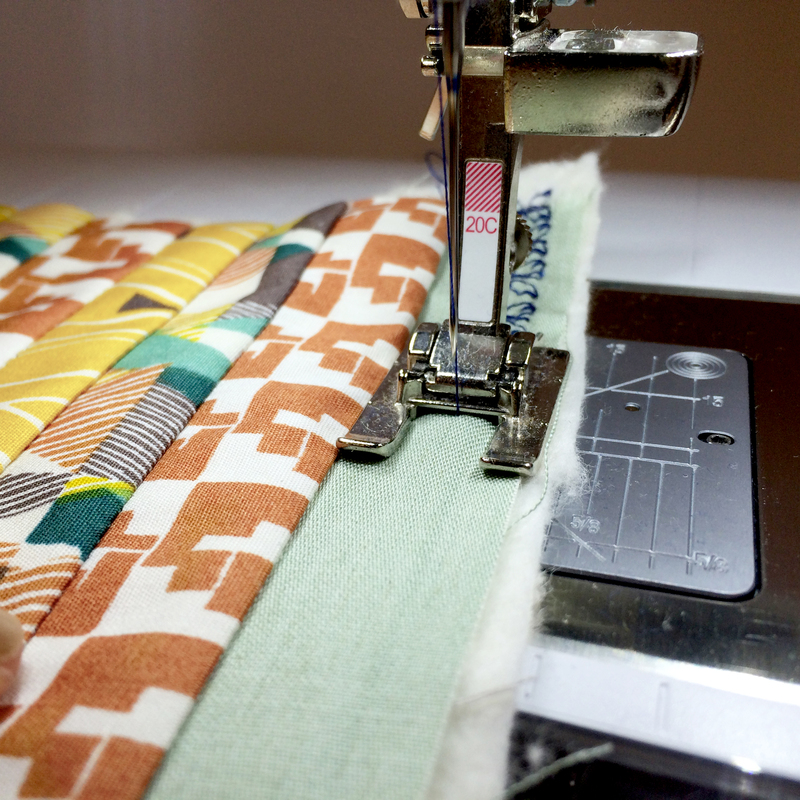 Continue pressing seams to the same side as you stitch them. 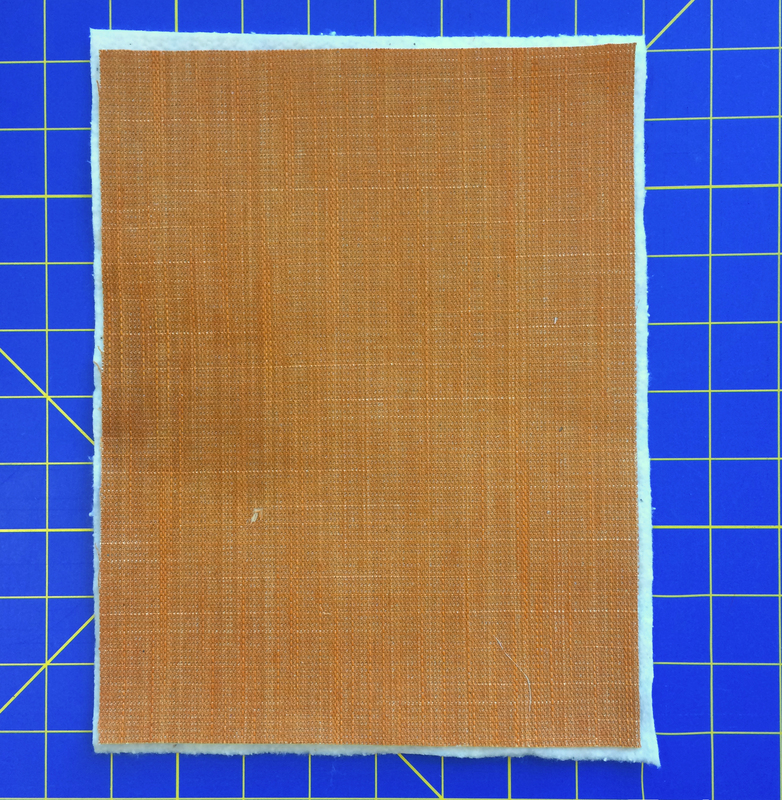 Continue with the rest of the fabric pieces following the order on the first image above. 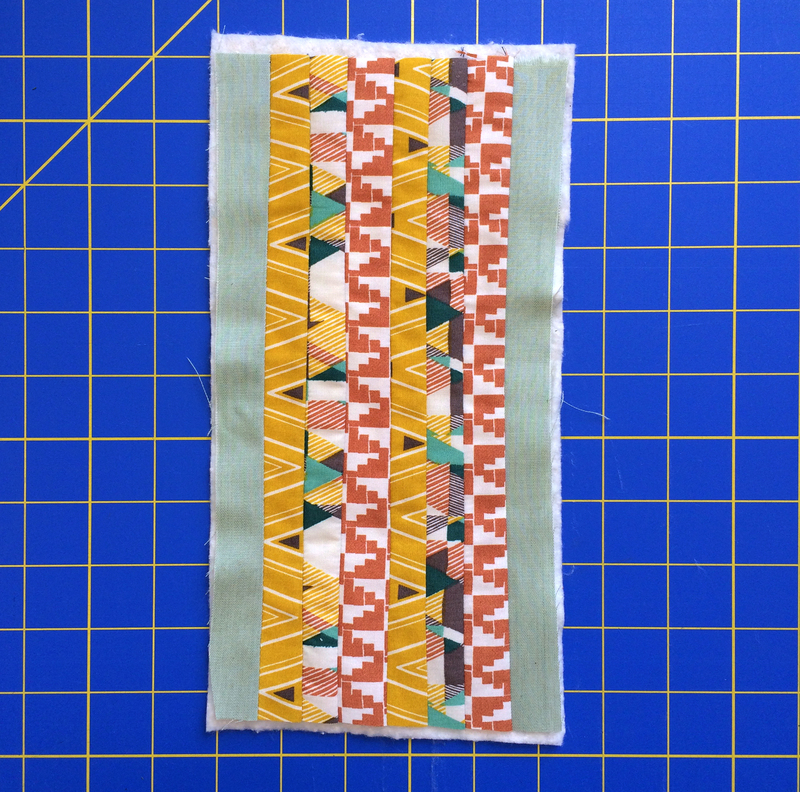 You will end up with a piece looking like this, don’t forget to trim the edges. 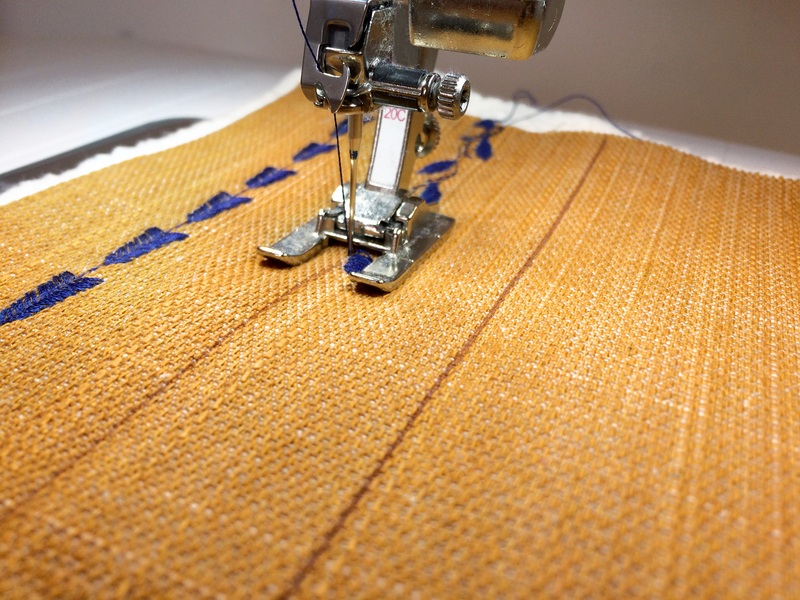 Replace your presser foot to the Open embroidery foot #20/#20C/#20D and change the stitch number to #655. 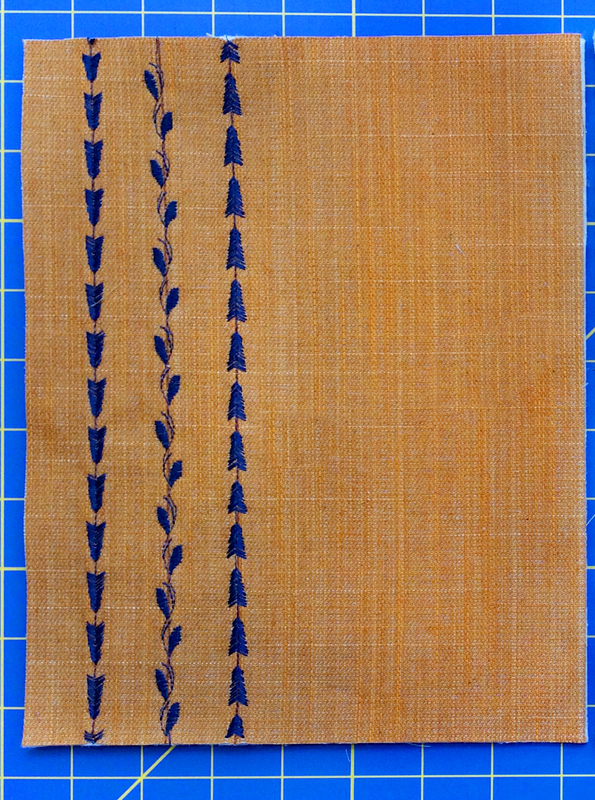 Stitch only on Fabric E stripes. Your piece will now look like this. 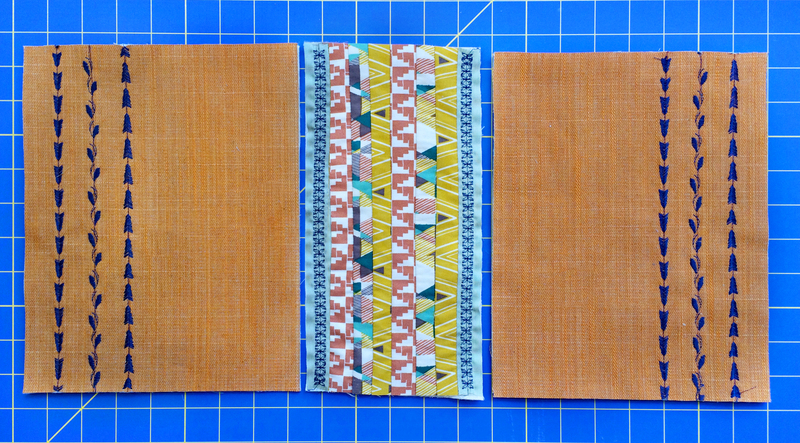 Lastly, attach all three sides together. 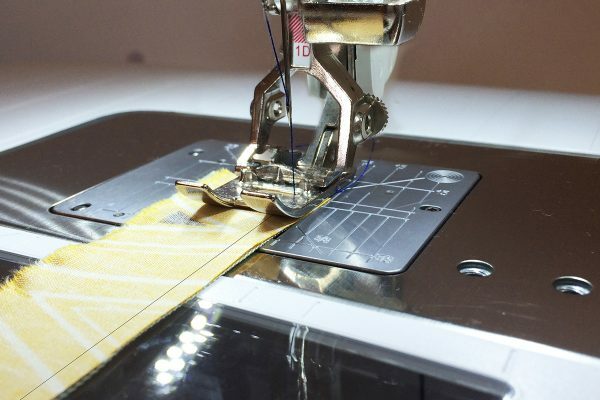 Remember to change the presser foot of your machine back to the all-purpose Reverse pattern foot #1/#1C/#1D and change stitch to straight stitch #1. For the backing of your pillow, take the remaining 2 (two) 9″ by 15″ of FABRIC F and follow Step 3- Pillow Backing of The Essence Pillow Case and you are good to go!